Mark Sutherland of Sterling, Massschusetts, collided with a pickup truck when his snowmobile entered a plowed private road while sledding in T17 R3 WELS, near Long Lake, on Monday. 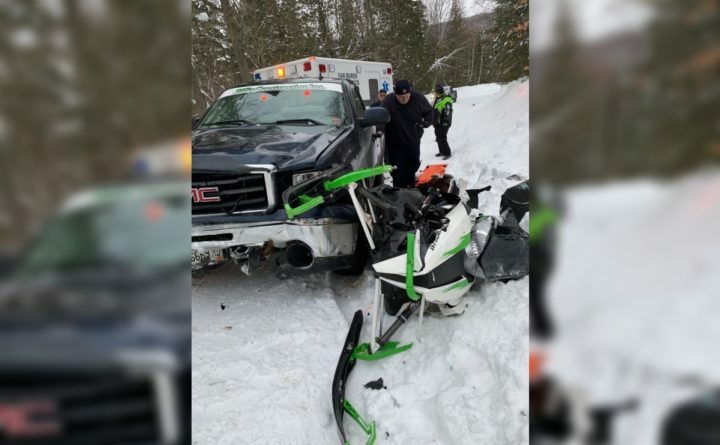 A Massachusetts man was injured after game wardens say his snowmobile collided with a pickup truck in Aroostook County. Mark Sutherland, 48, of Sterling, Massachusetts, failed to stop his snowmobile when he traveled from Connecting Trail 96 onto East Road in T17 R3 WELS, near Long Lake in northern Maine. Sutherland’s riding partner witnessed the crash, and said Sutherland was not familiar with the trail or the intersection, according to the Maine Warden Service. When Sutherland entered East Road, which is a private, plowed road, William Laplante was traveling through the intersection in his pickup truck. Sutherland’s sled struck the grill, front bumper and plow frame of the truck with enough force to spin the truck completely around, according to the warden service. Sutherland was transported to Cary Medical Center in Caribou, where he was treated for a broken leg and possible pelvis and rib injuries. Laplante was not injured. Game wardens said overgrown tree limbs and snow banks on the trail obscured a stop sign that was intended to let sledders know they were approaching a plowed road. After the crash, wardens worked with Gateway Snowmobile Club, which maintains that portion of the trail. The club is working to make the intersection more visible. Game warden Adrian Marquis said snow depths in Aroostook County are unusually high for this time of the year, and have made many trail intersections in northern Maine dangerous. Sledders are urged to use extreme caution when crossing roadways.